We Resist | Because our children deserve better lives. With F16s, it’s a scary roar like someone is mocking sounds in a water well. It also depends on the altitude of the plane, sometimes a high pitched roar, others a low distant one. F16s are harder to spot than drones or Apaches because they are always ahead of their roar. And since you never know where the plane is going and since buildings in Gaza are crammed into Gaza, you rarely get to see the metal falcon. I saw the plane once, of course Israel has many of them but I guess they all look the same. I think the sound of F16s flying by is quite similar to normal passenger planes when taking off, not that many people in Gaza know how a passenger plane sounds when taking off. However, in Gaza people know something is wrong and that the pilot is practicing for future preys. Now the sound of the jet flying by is no problem as long as it doesn’t drop anything. I don’t remember many raids done using F16s from my childhood, but my recent years as a teenager, and while still calling myself child, were full of them. At first, as I remember, they used to conduct a lot of mock raids. A mock raid is far more scary than any sudden sound you’ve been startled with. Out of nowhere, a sudden blast jumps in, leaving your ears almost pierced and your heart running as quickly as it can. You’d think it’s a real raid nearby, so you run for cover. Fortunately, your racing heartbeats and your pale face are your only injuries. 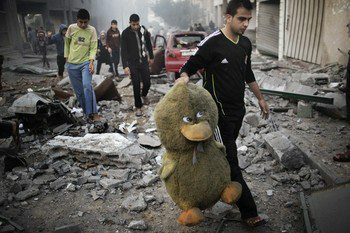 In 2005, four people were reported dead because of these mock raids and panicking because of other raids on the Gaza Strip. The four had chronic diseases; heart conditions, blood pressure, diabetes. Other people were brought to hospitals when their ears started bleeding as a result of the sound pressure. In addition, hundreds of children and women were carried to hospitals as panic injuries. Mock raids are fine, as long as the plane doesn’t drop anything! When F16s drop something, which happens more often than mock raids and sometimes more than just passing by, the damage is shattering. Let me recall some of the attacks conducted by F16s, those that I remember. I was fourteen when the AbuSelmeyyas’ house was attacked by an F16 air strike. My body shivers as I write this. The attack killed the father and mother and seven of their children, Nasrallah 4, Aya 7, Yahya 9, Eman 12, Huda 14 who was my classmate in primary school and who had the most angelic voice I’ve ever heard, Sumayya 16, and Basma 17, leaving Awad, 19 at that time, injured and alone. Fourteen others were injured in that attack, since the house was located in a heavily populated neighborhood, not very far from where I live. The attack attempted to assassinate leaders of militant groups. However it failed. In October last year, The Israeli court in Jaffa refused to give any compensations to the relatives of the family and the only member if the family left, saying the house was targeted during a “combat operation”. I wasn’t allowed to see any news about the attack. I only heard some news about it. And I learned about Huda in the morning. I heard from my brother that day that the bomb was directly dropped on the room where the mother and the children were. I also heard about their body parts being found in the buildings next to their house. I was only fourteen. What did I know. Another attack, which is more recent, is the attack of the AlDalous’ house. 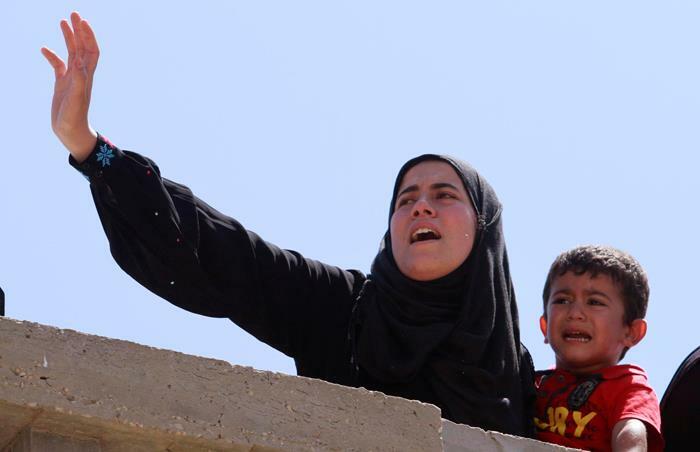 An F16 targeted the house while it was full of children and women. I had no electricity that day, and I was listening to the radio trying to figure out what the last huge explosion was. The attack took the lives of four siblings, Sarah 7, Yousef 4, Jamal 6, and Ibrahim who was nearly a year old, in addition to their grandmother Suhaila 73 and their mother and aunts, Samah 27, Raneem 22, and Tahani 52. Two neighbors of the family were also killed, grandmother and grandson, Ameena AlMzannar, 81, and Abdallah Al Mzannar, 18. Four days after the attack and after digging in the rubble of the three story house which was dug to a hole in the ground by the attack, two other bodies were found. One belonged to Mohammed Al Dalou, 29, and the other was his sister Yara, 17. This house is also located in Al Sheikh Radwan area not very far from the first one I mentioned and not very far from where I live. The explosion was very huge that so many people in that neighborhood couldn’t breathe when the smoke sneaked into their houses and nine were injured. The houses around the Al Dalou house were also damaged. F16s are usually used to destroy targets that are very important for Israel. During the latest attacks, Israel used them to destroy civilian houses and to target empty farm lands. They were used to destroy a Palestine playground, two extremely important governmental buildings with more than five rockets each in addition to other police stations. Many houses were warned by drone rockets 5 minutes before F16s practically blew them to pieces. Residents of these houses may get injured on the way out or in the street while running away from the house. Many families weren’t warned. The house would be targeted while civilians are still inside. And the attack would end up killing half or all of the family members, as in the Hijazi family when an attack killed the father and his children, with their mother left severely injured. The damage caused by F16 explosives is incomprehensible. The house targeted is completely destroyed and turned to rubble. Sometimes, if the plane dropped more than one bomb, like the AlRayyan family attack in Operation Cast Lead, a whole block would be destroyed. Houses around would be partially damaged, losing front walls and having bricks falling on their residents . The glass of the windows of the houses in a range of 50 meters around the house breaks and injures people inside. If the target is an empty lot, a huge hole is left after the attack, leaving houses around with broken windows and dirt all over their walls. Sometimes, houses around are not that strong. When they don’t have concrete roofs, and have tin roofs, they collapse or at the least the roof flies away, even if the target was empty land. If the target is farm land, trees die. The land becomes unfit for cultivation for several years. The psychological effect the planes leave is also devastating. Like I said, the explosions are sudden and very loud. During the latest offensive, we couldn’t hear the planes before they dropped their bombs. The impacts cause earthquake like effects. The houses start shaking back and forth, the windows and mirrors shiver, and sometimes you hear your bed moving too. Sometimes, we would hear the whoosh of the bomb while it’s falling and wait for the explosion to rock the ground. Other times we heard nothing. Only the ground shook. Since at times the ground shakes before the explosion, the sound is never as loud as you expect it to be. It’s always louder. And you blink or jump from your seat no matter how many times a minute an F16 drops a bomb. After a number of days of incessant loud explosions and air pressure pressing on your ears and making sure you’re still alive every five minutes, you start cursing Israel, the US government, your political leaders and everyone participating in the daily act of terrorizing you. Living under drones is not only life threatening, but unbearably annoying. At times, drones don’t leave the sky of Gaza for a long period of time, a week or more. It’s like having this huge fly in your room that can’t understand how the glass of the window is blocking its way out. At times, you start swearing at the drone like it’s one of those irritating people that nag all the time. Some people, like my father, who have very sensitive ears have a really hard time dealing with the constant buzz of the two or three drones that are circling their neighborhood. They would try everything to ignore the bee like sound following them everywhere they go. At times like that, getting to sleep turns to be the most essential need of the human brain of the one million and a half population trying to cope their ears with the couples of bees flying over their shoulders. During the latest offensive on Gaza, it was hard for anyone to sleep for a whole week. It was nerve breaking. The endless buzz of the drones was accompanied by sudden explosions that would occur every five minutes. Sometimes, more than five explosions would startle you in less than a minute. After seven days of the continuous drones and the piercing bombings and of bad sleeping and sometimes having no electricity, you feel like stuffing your head somewhere under pillows and blankets. That wouldn’t work either. Believe me; I tried. Your body eventually surrenders to its exhaustion and you go to sleep however constantly awoken by the earthquake like effect of the bombs. However, complaining about the buzz seems ridiculous when you hear about or see drone attacks. When I was thirteen, a drone targeted a small goods truck passing by my home. It was summer. The night before the attack, I had asked my mother if I can sleep in the balcony. She said the mosquitoes will keep sucking my blood until they feel no more thirst. The idea frightened me. In the morning, there was more than mosquitoes to make me look bloodless. I had been sleeping on my parents bed and I had just woke up and got out of it. The explosion was sudden and deafening. Another explosion followed. I screamed and got down on the floor. The window, which was directly above the bed I had been lying on a minute ago smashed into pieces and the pillows were covered with glass. Nothing happened to me, and I don’t remember if I was really scared that day. I remember everyone rushed to the windows to see what was going on so I rushed along. That day, no one was injured. The people in the truck managed to escape. Luckily, it was morning and the children of the neighborhood were still inside. Had it been just a little bit later during the day, a lot of children would have been injured. That was a long time ago and it’s nothing compared to the other drone attacks that are conducted here. Drones can attack people standing in the street and their rockets have the ability to shred their bodies into pieces, like the two AbuAmra brothers who were attacked during the recent attacks on Gaza and so many others. The other martyr was Nabeel’s brother, Ahmed. Most recently, drones were used by israel for a new purpose. They call it “ a warning attack”. They target a house with one or two drone rockets that can partially damage the house and give a period of time, mostly three to five minutes, for the residents of the house and their neighbors to evacuate the house. First of all, a drone rocket can tear bodies to pieces and can make bricks of the roof fall on the people living under it. Meaning, it can never be called a “warning” attack. Second of all, three minutes is barely enough for the residents to run for their lives before the house is leveled to the ground. In many cases the house, which gets attacked in the middle of the night, is attacked with an F16 war plane while its residents, mostly women and children, are just stepping out of it. The Azzam family in AlZeitoun area is an example.Three people, a young woman and a child and a man were killed in that attack. More than thirty civilians, most of whom being children and women, were injured while running away from the bomb that attacked their house four minutes after it was attacked by a drone rocket. “ What do they want from us?” was the response of a little girl in the hospital that night. In Gaza, I sit behind my screen, devastated. “I don’t want to report on twitter, anymore” I think to myself. Then I take my words back and try to keep myself busy with it. For the last seven days, I’ve been following the news, translating them and posting them on twitter after they are “confirmed”. One martyr here, another there. A child here, a child there. A woman here and a woman there. One, two three injuries coming into Alshifa hospital. I’ve been eliminating my feelings for seven days. I’ve been watching my language, spelling, punctuation and feelings. Today, I broke down. For a moment, I didn’t care where the last explosion was. If what exploded has exploded, what is my tweet going to do about it, I thought again. My Mom said the name of the place being targeted in surprise. Why are you surprised, I thought again. They’ve been bombing children for the past seven days. Why on earth are you surprised they’re targeting a commercial building. In Gaza, children, if their lives were spared, wait in hospitals, bandaged and scared, for their dead mothers to rush towards them. Others lie alone, along with their siblings, or beside their father, faces deeply cut, hearts still as rubble, their eyes sleepy as in the night before when they couldn’t sleep, some with twinkling eyes. Still, they breathe no more. In Gaza, a mother runs to hospital praying and hoping that the unidentified torn child isn’t hers. She knows it’s him. He was playing football a second ago. His jacket is also torn there beside their house. She is definite. She only collapses when she is confronted with the fact. In Gaza, a man, blouse drained in blood, cracks when a doctor tells him that his son is already dead. He doesn’t know in which corner he should hide his face. A wall interrupts his strides. And, he crumbles there. A boy, in Gaza, hasn’t spoken to anyone since the news of his friend’s death. He walks in his friend’s funeral with endless looks inspecting the nothingness before him. In Gaza, four generations live. The youngest is buried. After seven days, all you can do is blink. Let me take two minutes of your time to tell you the story of a four year old kid. They were going to visit their grandmother. He talked all day about the new little racing car she bought him. How he was going to meet her was occupying his thoughts. A hug. A kiss to her right cheek. A kiss to the left. He’ll sit next to her until he receives his gift. He’ll hide it with his Mom after playing, alone, with it for a few minutes, and he’ll play with the kids in that neighborhood. He’ll keep it nice and clean for the first day of Eid with his friends. They jumped in the Taxi. His mom embracing his little sister, him sitting in the back seat behind his dad, dad asking the driver, who was a relative, how he was and how everything is going on with his side of the family. The kid with a smile on his face looks through the window to see a group of long bearded men with small hats attached to their heads. He knows who they are. This must be trouble, he thought. They throw something on the car. His dad shouts to the driver to drive faster. Before he knew it, that thing sent its flames to his skin. The flames embraced his sister and clutched to both his arms and leg. He felt his face being scratched. The screams of his mom and sister crawled to his mind vaguely. He couldn’t hear his dad or the driver. He, along with his sister, mom and dad, is spending his Eid in intensive care with limbs wrapped in white, eyes swollen, and face scratched. His grandmother is sitting right next to him with her white scarf and majestic tobe (traditional dress). She reached for him although he was meters away then. She reached for him like she had some kind of a magical power, promising that she will never let go. Her hand failed to come back to hold her son who was feeling insecure with one arm around him. She let her tears wash her anger away, allowing sadness to cover her beautiful black eyes. She looked at his brothers, friends, cousins, neighbors carrying him away while furiously screaming. Her hand kept reaching out for him. He vanished behind the hill. She lost him. Forever. My grandmother should have a twitter account. She’ll pray for everyone that follows her and retweets her tweets and curse the ones who don’t. You see. My grandmother has a vision. She thinks that we will go back to Elblad_ 1948 lands, Qatra, her village_ one day. When my sister got engaged to a guy from another village_ of course he’s a refugee and has never been to his village_ she said “rah yakhdik a’hadeek elblad!” _He’ll take you to that village! With a tone implying that his village is halfway across the world. Now my sister is married to that man and has two children and still lives in Gaza. I miss the days when I was a kid and I used to sleep over at my grandparents house. She always woke up early to start cleaning and finish all the house chores early. She never likes waking up with a dirty kitchen and if she does, she starts cursing. She always analyzed political events while cleaning the floor or the bathroom. “This will happen ya sitti _ my grandchild_ and that will happen ya sitti. They did this because of that, those dogs. Don’t they fear God!” She curses all political parties when israel provokes them. My grandmother is a proud woman of her village and traditions. Her eyes would glitter while talking about what they used to do in elblad. She’d explain everything in details. How they used to celebrate weddings. “7 nights and days ya sitti, not like nowadays a stupid party and that’s it.” Her talk would go on, and as you listen your admiration for her grows bigger and bigger. “Ow the gold jewels the bride puts on her head were fascinating” She’d go on. You would mistake my grandmother for an intellectual. She’s was taught how to read by a family member in a late time of her life. My aunt once wanted to take her to lecture some highly educated women. She regretted not doing so. Her knowledge about everything dazzles you. She knows everything from cooking to chemistry and history. Her hands add a special taste to her food. I can recognize its smell anytime_ not because she adds too much onion, actually the smell of onion vanishes because she likes to boil her food a lot. I have no clue why, when I was a kid, I used to think of elblad when I smell her food. 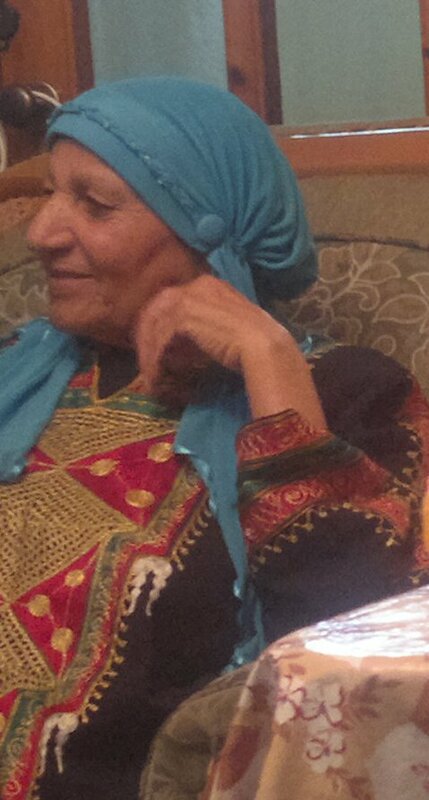 My grandmother is a sacred figure to me, for she has been through Nakba as a child, 67 war as a mom, Operation Cast Lead as a grandmother. I have never dared to ask her how she felt or how her experience of leaving her heaven-like land was like. I’m afraid she’ll either burst into tears or start yelling at me or at least curse Arabs. My fear of asking might be a result of me fearing to go through what she went through. I didn’t even know if my eyes were open. After a big mess everything seemed so calm I could sense the dust covering my face, the only part I could feel. I could feel my breath hitting one of the bricks of my room’s floor. Air found its way through everything surrounding my body. Silence was all I could hear. My arms trapped somewhere under the wooden edges of my bed, my toes, my legs, my hair, they all were jailed and penalized not to move. I was afraid. I waited and waited trying to recall all the joyful events in my life, as my mother once advised me to do so when I’m afraid, though they were few: My elder brother’s big wedding, my grandmother coming from Hajj and bringing me a doll singing, the last Eid when I got my biggest Edeyya ever, my mother bringing us home a new baby after me _I wonder if that was a happy event for me, but I could certainly see the joy my parents had looking at that little thing. My breath firmly came back to my face touching it as to comfort me and tell me that everything will be ok. A minute later I started crying, though. And only then I realized that my eyes were closed, for I could feel my wet eyelashes. It did not matter; opening them and closing them were thoroughly the same. I cried so much that my tears mixed with the dust on my face felt like mud at the edges of my face. I must have been bleeding, since a killing pain started growing in my chest with the growing of my weeping. I tried to move in order to stop the pain. Only one muscle, I found out that something very sharp, extremely strong, calmly was standing through my skin. I stopped crying. I waited. I bled.